None of us really asked or wanted a Jumanji sequel did we? There didn't feel like a massive need to revisit this world, to reboot it, to refresh this world for our times did there? Ultimately no there was no need really but thankfully no one listened and now we have a Jumanji sequel that entertains, provides laughs and deals with teenage angst with great aplomb. Four teenagers, thrown together in a minor breakfast club style convenience in detention happen upon a game console, complete with a Jumanji game cartridge and luckily enough four controllers. Having been lectured by their headmaster on 'becoming who they need to be in our world rather than who they want to be' it is not long before they find themselves sucked into the game and have to save Jumanji from a new evil. What follows is a series of action sequences, body swap jokes and CGI creatures that in other hands would leave a viewer flat, disinterested and contemplating setting up an actual board game just to have something to do. However, Jumaji: Welcome to the Jungle is different and that is largely down to the foursome of Johnson, Black, Hart and Gillen (a great law firm name if ever there was one). There is a wonderful chemistry between the four stars and you sense that they are genuinely having fun within this nonsensical world. All four play their avatar really well with great physicality as well as maintaining a wonderful teenage awkwardness throughout. They seem to carry a great self awareness that teenagers themselves can hold, hyper aware of their appearances, behaviour and interactions with each other. Kevin Hart provides a plethora of laughs and his chemistry with Dwayne Johnson is excellent (no surprise for fans of Central Intelligence). Johnson is as great an action hero as you could possible hope for in the times we live in, with an overwhelmingly warm charisma making him incredibly watchable, no matter what nonsensical chase sequence he finds himself in. Jack Black finds himself in the role of Bethany the most self absorbed, shallow member of the group. A wonderful physical comedian, Black excels in presenting the demeanour of a young Instagram loving , phone obsessed teen and certainly garnered the most laughter in our screening. Karen Gillan plays Martha the slight awkward teen who finds herself in the game as Ruby Roundhouse, an expert in many martial arts and dance fighting. 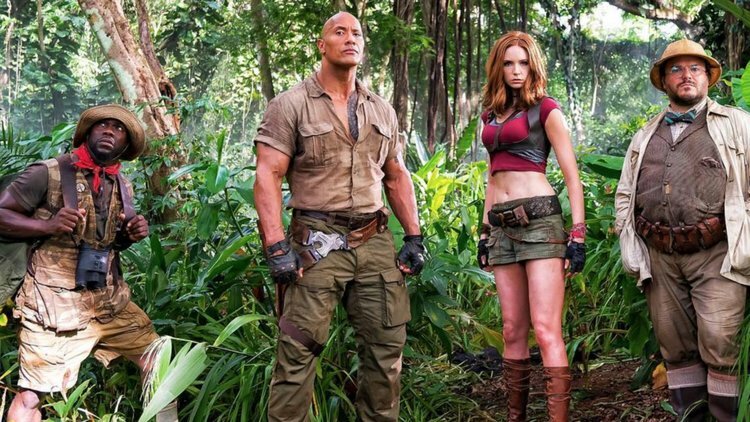 Her in game attire attracted many outraged tweets when the first shots from the film were released, but this is more than adequately addressed as she calls out the stupidity crying 'Why am I wearing half a shirt and short shorts in the JUNGLE?' The film makers are aware of how the appearance would be perceived and perhaps have intended to make a statement of how female characters within gaming are portrayed, there is after all more than a passing resemblance to Tomb Raider's Lara Croft in Gillen's attire. The message at the heart of Jumanji is to not let who you are be defined by looks, athletic abilities or the number of Instagram likes you acquire. True joy is found in seeing the value in everyone and not judging books by their cover. Jumaji: Welcome to the Jungle is filed with convenient plot contrivances and nonsensical CGI chase sequences and a level of predicability, but with a charismatic cast, warmth, fun and a good message at its core I am very pleased that a Jumanji sequel exists. You know the old saying sun, sea and cinema trips. That’s how it goes right? Well, certainly in our house that’s how it goes and given the weather in Belfast there is usually a higher number of cinema trips than there are adventures to the beach! With the kids on summer holidays, cinemas traditionally ensure there are plenty of options available for weary parents looking some respite from either rain and/or the relentless questioning and requests. This time is sacred. A time to forget the rows, warring siblings, the relentless Irish rain and a chance to be together united in laughter and enjoyment of a good film (hopefully). Over the course of the summer we have made it to three of the big family releases. Despicable Me 3, Captain Underpants and the Emoji Movie have all been encountered so I thought why not combine the three and find out which (if any) have the much sought after Films and Faith seal of approval. First up was Despicable Me 3, my kids love this series of films and while a third instalment may seem unnecessary the cash is still rolling in so the studios are no doubt already scheduling Despicable Me 4. After he is fired from the Anti-Villain League for failing to take down Balthazar Bratt (who is wonderfully stuck in the 80s), Gru finds himself in the midst of a major identity crisis. When a mysterious stranger shows up to inform Gru that he has a long-lost twin brother he sets off in search of his sibling in order to rediscover who he really is. These films have always had an element of family journey within them. Whether it be Gru taking on the responsibility for the kids in the first film or finding love in the second he has always been finding himself and extending his family in some way throughout the franchise. Surrounded as always be the bumbling and endearing Minions there is an element of ‘rinse and repeat’ with this instalment but it still works for the most part and certainly we laughed our way through and had a great time with it. Next up Captain Underpants! Based on the series of successful books this is the story of two imaginative prankster friends George and Harold who love nothing more than creating comic books starring our titular hero. The pair are trying to negotiate school and avoid run ins with their oppressive headmaster Mr. Krupp. When the accidentally hypnotise Krupp into believing he is the real Captain Underpants they unwittingly unlock a world of super hero adventure. The Captain Underpants stories are not books that have made it to our house yet so I was unsure how the film would be received. However, within minutes we were all enraptured and laughing hysterically at the various gags and fart jokes within. CGI animated but with a lovely hand drawn aesthetic there was simply something refreshing about this story. There is no great depth to it but it was great to see fresh ideas and ways of presenting these on screen. To have two young kids on screen who were creatively minded producing this ludicrous character, albeit by accident, filled my kids (and me) with a little bit of wonder. Creativity is something that should be fostered and encouraged in kids and to see that play out on screen through such creative characters was really encouraging. I laughed probably a lot more than an adult should at Captain Underpants but the car journey home was filled with shouts of his ‘Tra-la-laaaa’ catchphrase and I knew then how much of a hit it had been! Last up on our summer of cinema was The Emoji Movie. If Captain Underpants inspired creativity and freedom of ideas this sadly reminded me of colour by numbers. Set inside the phone of a teenage boy The Emoji Movie is about Gene a meh emoji who is more expressive than the others who simply perform their one role. In essence this movie is about the acknowledgement that we are created for more than one thing. We don’t have to be pigeon holed. We don’t have to stay within the rules of who we are told we are. We can be who we want to be. In truth though this is little more than a bland, half-baked attempt to rehash The Lego Movie. The film is not funny and spends its time cynically referencing apps and at times is incredibly dull viewing. This is quite simply a quick cash grab attempt by a movie studio and sadly, looking at box office, it appears to be working thus far. While my kids say they enjoyed it I was less than impressed and hope that I never have to endure this film again! Suffice to say then that The Emoji Movie is not the recommended summer family cinema trip. While Despicable Me 3 was enjoyable the award must proudly go to Captain Underpants which was a funny, engaging and catchphrase repeating joy of a cinema trip and is therefore the Films and Faith recommended family film of the summer! War have you been watching this summer? Let me know in the comments section and let me know which of these were your favourite.